No, these are not packages of drugs. Do not misunderstand. These are Taoist rice in tea leafs. I bought them at the peak top at Wudang mountain. They are so mini and they told me I had to steam it before consuming. I didn’t tried it at Wudang mountains but took it back to Holland. Well, I’ll tell you how it tastes.. I was excited to taste the first one, is to me a really new experience of flavor, haven’t tried it before. It is different than Hong Kong Cantonese Zongzi, also known as rice dumplings which my grandmother made before I left Hong Kong. (traditional Chinese food). 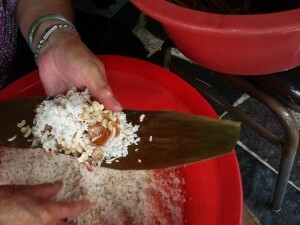 It is supposedly also made of glutinous rice. It is sticky, but it is more like grinded rice. Soft like cake and there are beans mixed between the rice. Very strong tea flavor, like green tea. After the first one, I had to take another one to really taste the flavor. It is okay, but after the third one I had enough of these. I think I’m just not use to it. 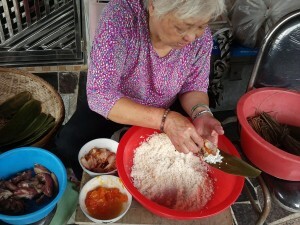 In China you have really lots of food and diversity coming from different regions. I mean in the north they have a different dishes than in the South, there are even so many kind of spicy flavor. I remember one time I asked for non-spicy food at the restaurant in Wudang. The waiter said that Cantonese food are tasteless in his opinion. What I know is that Cantonese food is the most popular of Chinese cuisine in Western world. People in Hubei (Wudang) eat a lot of spicy food and completely different dishes. this has to deal with weather circumstances and kind of geographic nature. I’d like my grandmother ones . .